The U.S. economy made significant headway toward recovery in recent months, with job growth and retail consumption both charting substantive gains. Challenges in the housing market, however, remain a drag on the broader economy. Despite increased affordability, attractive mortgage rates and the strengthening employment outlook, home sales continue to languish at a cyclical trough. Major hurdles facing the recovery of the housing market include tight lending standards, depleted savings, changing housing preferences and, most significantly, extreme caution by prospective homebuyers who fear additional value declines. Though the economy will continue to improve as other sectors compensate for housing weakness, future economic growth will likely remain restrained by the housing industry through 2011. Recent home sales trends indicate the housing market has yet to enter an organic recovery since the expiration of government incentives. February existing home sales fell 9.6 percent from January, while new-home sales, which are competing against discounted REO listings, reported a steeper decline. As home builders moved to overcome buyers’ preference for bank-owned listings, and as lingering winter storms curtailed house hunting, the median price for new homes dropped 15.7 percent during February. With new-home inventories at record lows and homebuilding activity at a virtual standstill, however, pricing volatility will likely subside through the spring season. Year-over-year foreclosure activity declined 27 percent through February, setting a 36-month low. Disruptions in the foreclosure filing process offer a temporary reprieve, but as financial organizations clear their processes, the volume of filings will likely increase. 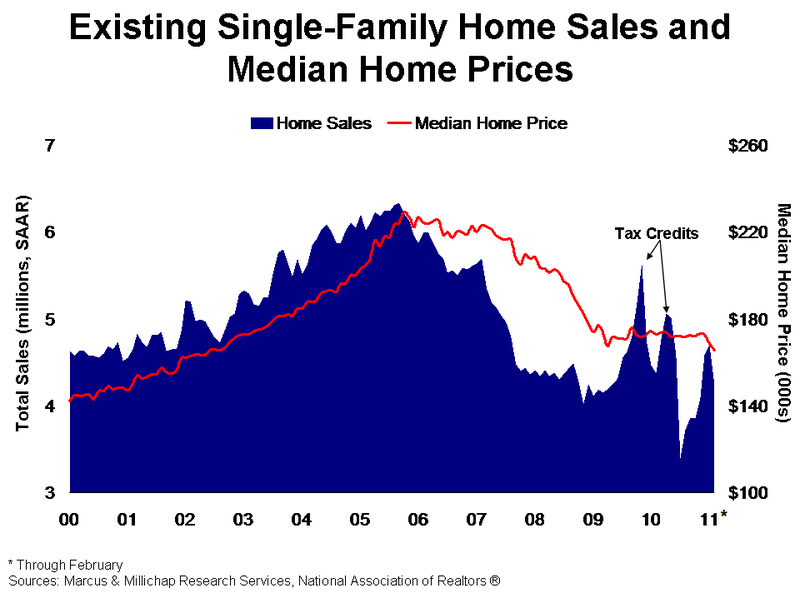 This rising supply of often deeply discounted homes will add to the backlog of inventory, presenting oversupply risks. Nonetheless, many investors have capitalized on REO opportunities, acquiring homes to redeploy as income-producing properties. Potentially, investor activity could absorb sufficient homes through 2011 to establish greater price clarity and thus stabilize the market sufficiently for prospective homebuyers to regain confidence in future values. The housing market’s plight will have a mixed impact on retail properties this year as retailers increasingly move to cater to entry-level homebuyers migrating into discounted homes. In hard-hit suburban markets, demographic shifts have already begun to take shape, offering expansion opportunities for discount retailers. Lower mortgage payments for new homeowners in most communities, however, will help elevate consumer spending, contributing to a 20 basis point decline in the retail vacancy rate to 9.8 percent this year. Class A apartment complexes were the prime beneficiaries of last year’s release of pent-up renter demand as households moved to capitalize on steep discounts in desirable top-tier units. As stronger office-using job growth enables more young professionals to re-establish individual living situations in the year ahead, Class A operators stand poised to raise rents in line with steady occupancy gains. During 2011, the national Class A vacancy rate will fall 120 basis points to 5.1 percent, facilitating an asking rent increase in excess of 4 percent. Beyond this year, rising rents in top-tier rentals, combined with greater housing affordability, will begin to entice qualified households who have delayed making home purchases to finally enter ownership. This entry was written by marcusmillichap, posted on April 11, 2011 at 11:51 pm, filed under Research and tagged Housing. Bookmark the permalink. Follow any comments here with the RSS feed for this post. Trackbacks are closed, but you can post a comment. Your post is simply spectacular and I can assume you are an expert on this field. Thanks a million and please keep up the fabulous work.